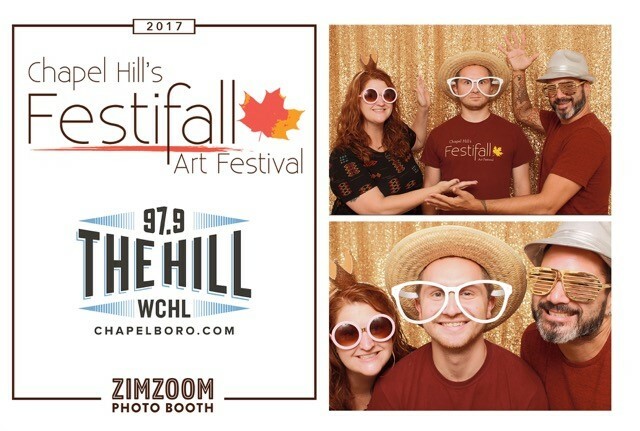 It's not just artists you'll see at Festifall! Check out all of our interactive vendors below; you'll find them in the Interactive Zone and spread throughout the festival grounds on October 7th. Kidzu Children’s Museum is a hands-on museum dedicated to inspiring young children and the adults in their lives to learn through purposeful play. Kidzu’s new 8,500 square foot space is multi-sensory, play-centered, and focused on providing area children and their families, teachers and caregivers an ever-changing menu of exhibits and programs that inspire creativity, collaboration and community. The Circulator allows the Chapel Hill Public Library to directly engage with members of the community wherever they might gather and extend the library’s footprint, services and impact beyond 100 Library Drive. The Circulator brings books as well as dozens of games, costumes, crafts and furnishings to events, creating a place to relax and talk with a helpful, knowledgeable and friendly librarian. The Community Clay Studio is unmatched in our community, with nine potter's wheels, three kilns, 1,500 square feet of well-equipped studio space and an abundance of natural light. The studio's programs and instructors foster self-expression and inspire the artistic sensibilities of participants of all ages. Pottery and other clay classes are offered for adults, teens and children year-round, and a clay arts camp is held for children every summer. Morehead serves North Carolina and beyond by bringing together the unique resources of UNC to engage the public for an improved public understanding of science, technology and health. Morehead's programs include classes for adults and children, exhibits, planetarium shows and presentations, special courses for teachers, summer camps for children, afterschool programs, memberships, public viewings of astronomical events and public lectures. The Orange Water and Sewer Authority is a community-owned agency that provides water, sewer (wastewater) and reclaimed water services to the Chapel Hill-Carrboro community. It provides high quality drinking water and wastewater services through responsible, sustainable and creative stewardship of the resources and assets it manages. Bring a reusable water bottle to Festifall and re-hydrate all day at their mobile water wagon! Paint Savvy provides quality, family-friendly services and events, delivered with integrity and excellence while fostering opportunity for artists and entertainers. Featured services include: air brushing, face painting, balloon art, glitter tattoos, hair art, henna body art, characters/mascots, water-walking orb, magicians, living statues, photo booth and caricature artists. With a mission “to unite the University, community and state in fostering emotional and financial support that improves the quality of life for the patients and families of N.C. Children’s Hospital,” Carolina FTK has through the years raised more than $5.1 million for N.C. Children’s Hospital and now involves about 2,000 students and dozens of community businesses. The Town of Chapel Hill proudly displays its Solar Energy Trailer here at Festifall! 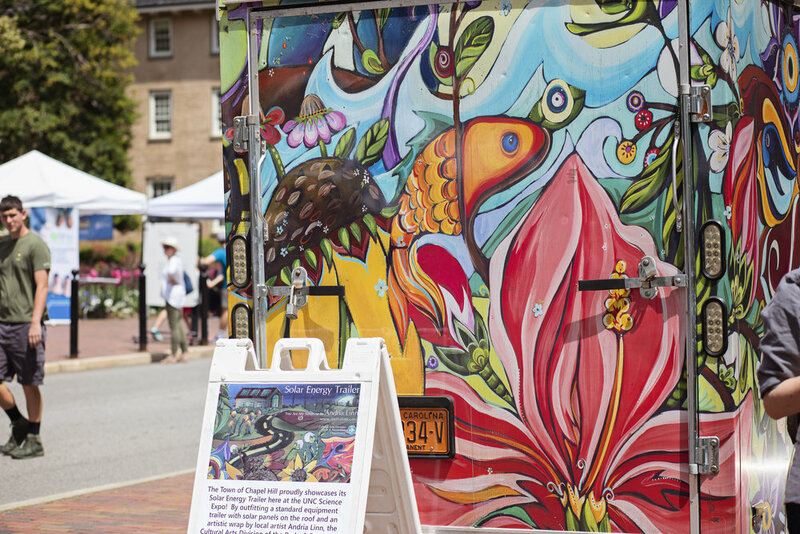 By outfitting a standard equipment trailer with solar panels and an artistic wrap by local artist Andria Linn, the Parks & Recreation Department has created a mobile, energy-producing work of public art that transports gear to community events and then powers those events using sunlight or solar energy stored in the trailer's batteries. ZimZoom is a boutique photo booth company focused on creating quality photography experiences for clients. They blend the latest technology, social media & professional studio lighting/camera equipment to create stunning photos that not only print instantly but can also be broadcast instantly – and the results (2017 Festifall team, looking fabulous, left) speak for themselves!